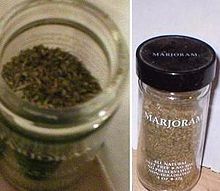 For other uses, see Marjoram (disambiguation). Marjoram (/ˈmɑːrdʒərəm/; Origanum majorana) is a somewhat cold-sensitive perennial herb or undershrub with sweet pine and citrus flavors. In some Middle Eastern countries, marjoram is synonymous with oregano, and there the names sweet marjoram and knotted marjoram are used to distinguish it from other plants of the genus Origanum. It is also called pot marjoram, although this name is also used for other cultivated species of Origanum. Marjoram is indigenous to Cyprus and southern Turkey, and was known to the Greeks and Romans as a symbol of happiness. 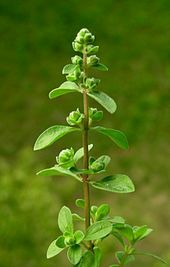 The name marjoram (Old French majorane, Medieval Latin majorana) does not directly derive from the Latin word maior (major). Leaves are smooth, simple, petiolated, ovate to oblong-ovate, 0.5–1.5 cm (0.2–0.6 inches) long, 0.2–0.8 cm (0.1–0.3 inches) wide, with obtuse apex, entire margin, symmetrical but tapering base, and reticulate venation. The texture is extremely smooth due to the presence of numerous hairs. Considered a tender perennial (USDA Zones 7–9), marjoram can sometimes prove hardy even in zone 5. Marjoram is cultivated for its aromatic leaves, either green or dry, for culinary purposes; the tops are cut as the plants begin to flower and are dried slowly in the shade. It is often used in herb combinations such as herbes de Provence and za’atar. The flowering leaves and tops of marjoram are steam-distilled to produce an essential oil that is yellowish in color (darkening to brown as it ages). 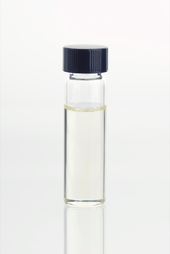 It has many chemical components, some of which are borneol, camphor, and pinene. Oregano (Origanum vulgare), sometimes listed with marjoram as O. majorana, is also called wild marjoram. It is a perennial common in southern Europe and north to Sweden in dry copses and on hedge-banks, with many stout stems 30–80 centimetres (12–31 in) high, bearing short-stalked, somewhat ovate leaves and clusters of purple flowers. It has a stronger flavor than marjoram. Pot marjoram or Cretan oregano (O. onites) has similar uses to marjoram. Hardy marjoram or French marjoram, a cross of marjoram with oregano, is much more resistant to cold, but is slightly less sweet. O. pulchellum is known as showy marjoram or showy oregano. Marjoram is used for seasoning soups, stews, dressings, sauces, and for herbal teas. ^ a b “Origanum majorana“. Germplasm Resources Information Network (GRIN). Agricultural Research Service (ARS), United States Department of Agriculture (USDA). Retrieved 2008-03-08. ^ “Marjoram: The Ancient Herb of Happiness”. Retrieved 1 April 2019. ^ Marjoram, Online Etymology Dictionary, Douglas Harper, November 2001. ^ BP Pimple, AN Patel, PV Kadam, MJ Patil. Microscopic evaluation and physicochemical analysis of Origanum majorana Linn leaves. Asian Pacific Journal of Tropical Disease 2, S897-S903. ^ “Marjoram, Herb”. Food Reference. Retrieved 28 February 2017. “Marjoram” . The American Cyclopædia. 1879.